I enjoy seeing my designs and ideas come to life, made possible by the facilities and support given here at NTU. Jemma tells us about the highlights of her first year at NTU. She also tells us what she loves about studying on our BA (Hons) Fashion Design course. "I knew NTU's Fashion Design course was renowned for shaping excellent graduates within the fashion industry. Over the last few years, the course has been known to produce some exceptionally talented and professional individuals who have made it into the fashion industry thanks to studying at NTU. When I attended an open day I immediately knew that NTU was for me; perhaps it was the warm welcome I received, or the amazing facilities and accommodation. It just felt right." How did you find Welcome Week and moving into halls? "Welcome Week really helped me settle into university – there were arranged nights out and opportunities to try out societies. There was a really great atmosphere around campus, and numerous opportunities to make new friends. I went out with my flatmates all week, we had a great time. "The Freshers Reps were so accommodating. Not only did they host activities in Welcome Week, but they helped us move in and carry all our belongings into halls. I reside in Gill Street South – it's one of the newest builds on NTU's City site. I settled in very quickly as I feel safe and happy in my accommodation, and now that I've personalised my bedroom it's like I never lived at home!" "My course is so varied in terms of activities. We are mostly taught in workshop scenarios, which is great, as you can engage in practical learning. I enjoy seeing my designs and ideas come to life, made possible by the facilities and support given here at NTU. I also like the freedom we have within our course to work with other students in the School of Art & Design. We are encouraged to use all facilities within the university to help realise our design potential." Could you tell us about any industry speakers you've enjoyed? "I am only one term into university and we have already had multiple speakers from industry. The most recent guest speaker was from Aaron Dowie, an alumnus from NTU who has successfully established his own brand in industry. I find industry visits so inspiring, and it was especially nice to see how far Aaron had come thanks to his degree from NTU." "The learning environment at NTU couldn't be better. I have access to all facilities I need to make my designs come to life in one building. Bonington is well equipped, with large studio spaces, sewing machine rooms, print studios, computer rooms, and even a fabric store where we can purchase materials at great prices. There is even the colour bureau in Bonington, as well as an art shop and fully functional gallery where they exhibit students' work." What has your highlight so far? "I have really enjoyed meeting new people and becoming more independent since moving away from home. My highlight so far would be handing in my first completed project – I collaborated with a first year Photography student to showcase my work, which was so fun. My course mates and I celebrated afterwards, which felt like a great milestone in our university lives." "Nottingham really is a student city. The City site has everything on the doorstep, as it is very much integrated into the city centre. I never have to venture too far, and if I need to travel further for any reason I can use the tram. There is a large shopping centre which is conveniently less than a three minute walk from my bedroom. The nightlife is great, and there are plenty of places to eat out. It's not too busy, but there is always something to do." "Anyone looking to learn and refine skills in design should definitely consider applying to NTU's Fashion Design course. We see through our designs from initial ideas to realised products, which is extremely exciting. 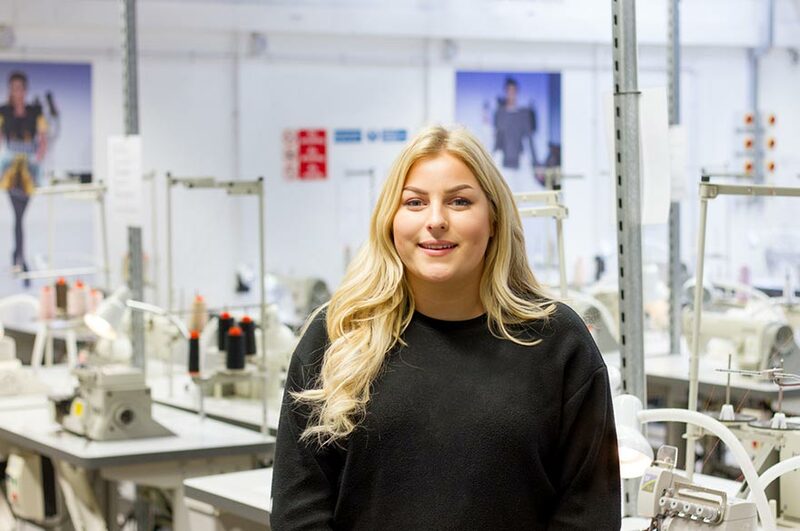 "There are amazing opportunities given at NTU, in particular fantastic exchange programmes such as a five-month placement studying at the Fashion Institute of Technology based in New York! I would recommend this course to people that enjoy practical work and are particularly interested in working in design without limiting yourself too much. There is scope to use the skills learnt from this degree and apply it to other jobs in the fashion industry." "I would like to study NTU's International Fashion Business top-up course in my final year of study, hoping to go on to secure a job working in e-commerce. Already I think the course has taught me much more than how to become a better designer, meaning I feel confident in exploring different roles within the fashion sector."